Jan. 22, 2014 – Scientists have known for years that stem cells in male and female sexual organs are regulated differently by their respective hormones. In a surprising discovery, researchers at the Children’s Medical Center Research Institute at UT Southwestern (CRI) and Baylor College of Medicine have found that stem cells in the blood-forming system — which is similar in both sexes — also are regulated differently by hormones, with estrogen proving to be an especially prolific promoter of stem cell self-renewal. 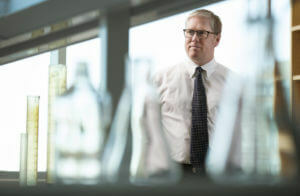 Before the finding, blood-forming stem cells were thought to be regulated similarly in both males and females, according to the paper’s senior author, Dr. Sean Morrison, Director of CRI, Professor of Pediatrics, and the Mary McDermott Cook Chair in Pediatric Genetics at UT Southwestern Medical Center. However, while working in Dr. Morrison’s laboratory as postdoctoral fellows, Dr. Daisuke Nakada, the first and co-corresponding author of the study, and Dr. Hideyuki Oguro discovered that blood-forming stem cells divide more frequently in females than in males due to higher estrogen levels. The research, conducted using mice, demonstrated that the activity of blood-forming stem cells was regulated by systemic hormonal signals in addition to being regulated by local changes within the blood-forming system. Research support for Dr. Morrison came from the Cancer Prevention and Research Institute of Texas (CPRIT); the National Heart, Lung, and Blood Institute; the Howard Hughes Medical Institute; and donors to Children’s Medical Center Foundation. Dr. Nakada is now a CPRIT Scholar and Assistant Professor of Molecular and Human Genetics at Baylor College of Medicine. The research was initiated in the Life Sciences Institute at the University of Michigan and completed at Baylor College of Medicine and CRI.